This giveaway is now CLOSED. Thanks so much to our wonderful sponsors Lenox and 1800flowers.com! We look forward to working with you again! The winner has been notified and upon confirmation, follower name will be posted both here and on our homepage. Remember: There are great giveaways active on the upper right hand side of the page! Is it just me or are we moving into Fall super fast? Kids are back in school (a few weeks away from first report cards), we are days away from Rosh Hashanah, fast approaching Halloween, and Thanksgiving will be right around the corner! When I think of September, I think of Indian Summer and trying to hold on to the sunshine for as long as possible. One of my favorite ways to keep the summer in my heart and in my home is via flowers. They always lift my spirits, and I like to have live bouquets in my home and the office weekly. I take time to arrange each flower and really get the right balance and symmetry. What ultimately sets off your arrangement is the Vase. You can't put the perfect arrangement in just any Vase! (Well sometimes you have no choice in the office, but you usually do at home). My grandmother and mom have beautiful Crystal Vases, which I always admired. As for me, I had a collection of Vases that came with the bouquets. An odd assortment of sizes and shapes, but mostly smaller, which meant when I bring home or receive a large bouquet I'd have to split them between multiple small vases. I'm not going to complain, because that gave me the ability to put flowers in almost every room, but sometimes you really want the bouquet you've received to remain intact. Especially if it's a hostess gift. 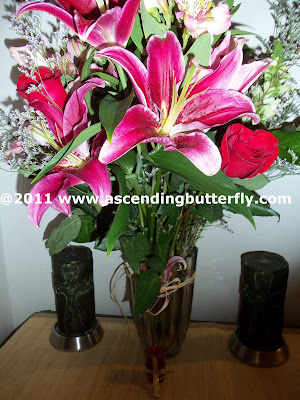 Flowers are my favorite hostess gift, both to give and receive. I know many of you will be attending and hosting special family dinners this season. I'm sure most of you are familiar with Lenox. Their dinnerware and housewares are on most bridal registries. What you may not know is that they have many designers who design specialty collections for them, including Marchesa for Lenox, Disney, Dansk, Donna Karan, and Kate Spade NY for Lenox. Kate Spade NY for Lenox is an amazing collection of dinnerware, serving pieces, flatware, glassware, Barware, gifts and Home Decor. I received the Kate Spade NY for Lenox Pleasant Hill Bouquet Vase, this Vase is available in 2 heights, a taller version and the one I received with a 'rounder' profile. I love the rounder profile and absolutely LOVE, LOVE, LOVE the butterflies! 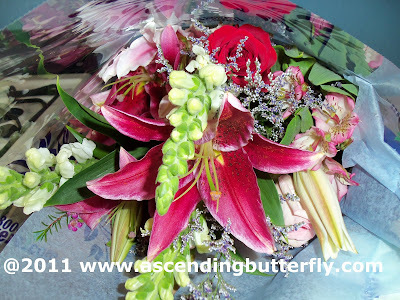 Ƹ̵̡Ӝ̵̨̄Ʒ - The wide mouth of this vase is designed to accommodate a full bouquet. 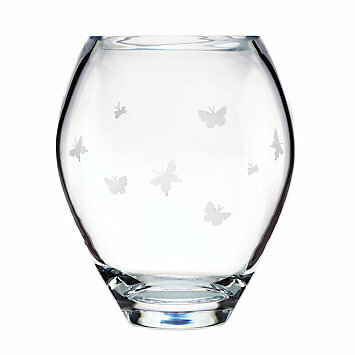 Ƹ̵̡Ӝ̵̨̄Ʒ - Etched butterflies encircle the vase for a look that's chic with a touch of whimsy. What's a beautiful Vase without flowers right? I thought it would be perfect if our friends at 1800flowers.com joined in on the fun and added some flowers to fill up the new Vase! I was trying to get artistic, but I forgot to take a picture of them both side by side, I received a florist choice bouquet that reflected my personal favorites, and extras thrown in by the designer. I received TWO huge over-flowing bouquets! And ended up using 2 vases in 2 different rooms by the time I was done arranging! The Photo Above is my own Vase with the second bouquet, the candles, and candleholders are my own, and I used the Raffia that the bouquets came wrapped with for added decoration. 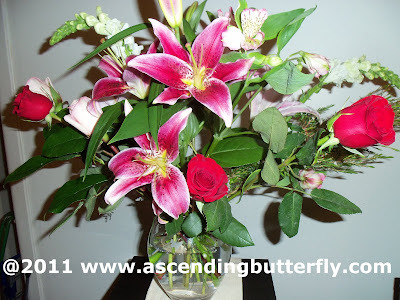 The Vase and flowers are beautiful, the scent filled my home for literally two weeks (using the powder preservative packets that come with the bouquets and changing the water every few days.) Flowers just always make me smile, and having the flowers welcome me home every day and waking up to that scent every morning automatically lifted my spirits. The Vase is elegant and beautiful, and the butterflies are very meaningful for me, butterflies have always represented those I love who have passed away saying hello, and symbols of change and luck for me personally, so this Vase carries all those meanings with it for me and I hope to never put it back in its box, I hope to have it out every day! Don't you just ♥ Kate Spade NY, Lenox and 1800flowers.com? I know I do! Ƹ̵̡Ӝ̵̨̄Ʒ - Follow Kate Spade NY on Facebook, Lenox on Facebook and 1800flowers on Facebook and tell them Ascending Butterfly Sent You or tell them which product you picked for your entry! (Please post the link to your facebook comment, you can get that link the same way you get your link to your tweets! If you don't post the link where you wrote on their wall I can't give you extra credit for it.) - Leave three separate comments so you can receive 3 extra credits for following each brand! FTC Disclosure Info for this Giveaway: This is not a paid insertion. This is a non-compensated post and all opinions regarding the products and the sponsors are my own experiences. I was provided product to facilitate the review and giveaway. The sponsors are fulfilling directly to prize winner(s), this in no way influenced my opinion of the products. Once a winner is selected and their information has been forwarded to the sponsor, the responsibility of prize fulfillment rests with the sponsor. This is a great giveaway. Thanks for the fantastic opportunity to win. Thanks for the chance to win! I am also a GFC follower "crave to save"
From Kate Spade NY I love this"
I'm following via GFC as Mercedes. I follow Lenox Corp on twitter as ptowngirl25. I follow 1800flowers on twitter as ptowngirl25. for my Mom's B-day. Thanks so much! I follow you on twitter @tracylr233. I forgot to put another Kate Spade item that I like in my mandatory, sorry! I love the illustrated plates though. adorable! I'm now following this blog using GFC. I follow you on FB-mary jaco.